Few games have affected me like The Legend of Zelda. My earliest gaming memory may be sitting on my father’s lap playing Super Mario Bros., but the first game I remember playing by myself is Zelda. It is the first game my brother and I fought over. The arcana of The Legend of Zelda is the mythology of my childhood. I not only dressed as Link on Halloween, I dressed as Red Link, fully powered up and ready to defeat Ganon. Sadly, the game is not so near to my heart now. The series has improved and left its arcane originator behind. Sure, I may occasionally complain about the hand holding prevalent in modern Zelda games, but that is a small price to pay when it removes the obtuseness of the series first iteration. However, part of me can’t help but miss the feeling of being completely lost in the land of Hyrule, with only my wits and the map packaged in with the game to help me. 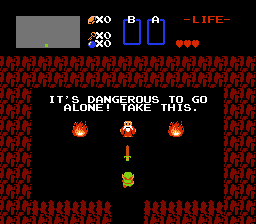 The Legend of Zelda really is the first great video game adventure. There were earlier, similarly styled games, like the aptly named Adventure for the Atari 2600, but none had the depth that Nintendo’s classic did. Hyrule, the world in Legend of Zelda for those somehow not familiar, is actually a place to explore. Mario’s Mushroom Kingdom is a series of disconnected levels, the castle in Casltevania was slightly more connected, but not game matched the cohesion of Hyrule, save for Metroid’s planet Zebes. 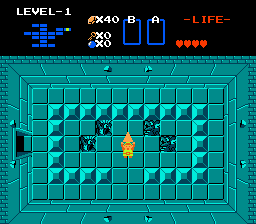 Instead of a constantly forward trek to the end of the level, Zelda was about exploring. The entire world was open to the player as long as he could find his way around. 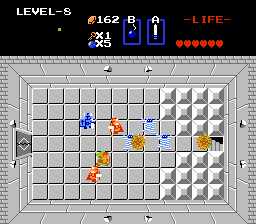 The only thing in the game holding the player back was the items obtained from the game’s nine dungeons. You do not necessarily have to have the weapon or tool from the previous dungeon to reach or beat the next one, but it certainly helps. The map was laid out on a grid and did not scroll. The player navigated by blocks and each block had a secret or point of interest. Sometimes it was a hidden shop or a fairy spring. Not all of these were good; some held angry old men who demanded you fork over hard-earned rupees to pay for their destroyed door. 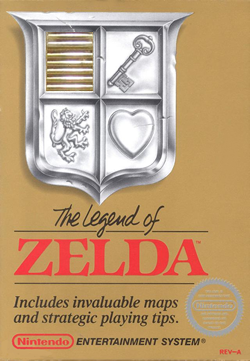 The game came with a half filled in map, leaving it up to the player to fill in the rest, as well as mark the secrets. (I had mine laminated) Enemies, octorocks, Moblins and P-p-peahats, beset the player at every screen. Some puzzles were built right into the map. To reach Level 5 you had to go up so many times on a repeating square to finally reach the top of the mountain. And I do not know how anyone made it through the lost woods without help. The made for memorable experiences, but today they would be decried as pathetic attempts for the developer to get you to also buy the strategy guide. The land of Hyrule felt more alive than any other video game world at the time. More so even than Metroid, the player was transported to the world of the game and left to discover its secrets. 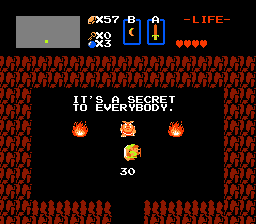 The wealth of tools the player was eventually outfitted with is one of the things that set Zelda apart. Mario had the fire flower and star, as well as numerous others by the third game, but he could only have one or the other. The Belmont’s of Castlevania had their trusty whip and their choice of one sub-weapon. Link had his trusty sword and bombs and a boomerang and his bow and arrow and a ladder, etc. Moreover, he had these all at the same time. If you wanted a different weapon, all you had to do was open a menu. Each dungeon gained the player another tool, another weapon to use against Gannon’s hordes. While not all of them had equal use, or any use (hello bait), there was enough game that even most of the lesser used tools had their chance to shine. The Legend of Zelda was hard, though. Even if the player could put together the scant and scattered clues to make it to the dungeons, some rooms in the later ones were just cruel. They were so filled with Darknuts and Wizzrobes the player barely had room to move. But the game had a forgiving death mechanic. If the player died, he was merely sent back to the entrance of the dungeon, or if on the world map the starting point. It was one of, if not the first games to use a battery to save your progress. While it did record the number of times the player died, there was no loss of progress. Restarting after death left you with the same tools and amount of map explored as you died with, though the dungeon had to be fought through again. This makes the hard game beatable. For those masochistic enough to want more challenge, there was the Master Quest, unlocked by beating the game or by setting your player name to Zelda. It is the same game as the first, only with everything scrambled and the difficulty bumped up another notch. 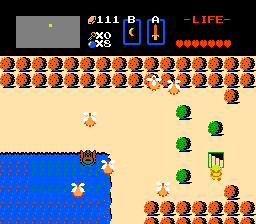 The Legend of Zelda is easily one of the most influential NES games. From the open world to the internal battery, everything Zelda did was copied. Except for maybe, it’s unique packaging. The box was gold, as was the cartridge. It made the game seem special before you put it in the system. And it was a special game. Unfortunately it successors do what it does better. Once I look part the rose-colored tint of nostalgia, I see the game for what it is: an ambitious but flawed masterpiece. It strains against the limits of the NES, but its sequels thrive without them. Play it, if you haven’t, if only for the music, but know that it has been surpassed. The bait is useful for distracting enemies. Put it in the corner of a room full of Goriyas and watch them walk round the outside of the room (often taking the long way round), and they won’t attack you. Also, you think the Lost Woods were impossible without help? You obviously never found the old woman just SW of there. She tells you exactly how to get through it. Actually, I don’t think I ever did find that woman. I didn’t say the Lost Woods was impossible without help, I just don’t know how people solved it. I fortunately had an older brother who already knew. And the bait doesn’t work on any enemies one would want to use it on. Do you need help killing Goriyas? Of course not, but since you get infinite uses of it, why not make things easier for yourself? It even works on Lynels, up to a point. One other thing. I never used to use the bait, but I decided to try it on a recent playthrough just out of interest. It has interesting results if you put it in the corner of a room. The enemies often won’t go straight for it, but they’ll take the long route round the outside of the room. Anyway, it’s worth experimenting with just to see its effect. You also might like Zelda: Outlands. I downloaded it recently and it’s really, really good. See what you think! Search for Zelda Outlands and you’ll easily find it.